Flipter is a microblogging platform that allows you to express your ideas, thoughts and opinions on any topic and to receive instant feedback. Whether you want opinions on a certain topic, advice on a specific situation, or feedback on your new idea, design or product, Flipter provides a quick, simple venue for it. It is a free web application that lets you brainstorm with the world with a neat and clean interface, robust analytics, and seamless Facebook/Twitter and blog integration. Flipter is one of the five winning startup companies that received a HKD $100,000 grant from Cyberport Hong Kong, an organization committed to nurturing ICT industry start-ups and entrepreneurs. After completing your profile, just head to “Home” and you’ll be able to see a public timeline of the different questions posted, or “Flips”. On the right side, there are also randomized Flips, as well as most popular questions and most used tags. Using tags, you’ll be able to sort and filter topics that you particularly like with a single click. It takes on a social approach by letting users follow people they find interesting. If you have your own website, you can create embeddable iFrame codes. You can also create Flips straight from Facebook with the Flipter Facebook app, or simply share it on Twitter. There are 3 kinds of flips to choose from. Get quick, no-nonsense answers with a simple yes or no, battle off two different ideas Face Mash style with the face off or let users vote among a set with the multiple choice. You can also post comments, share, or follow different topics. All answered questions will be displayed on your dashboard with publicly viewable stats. 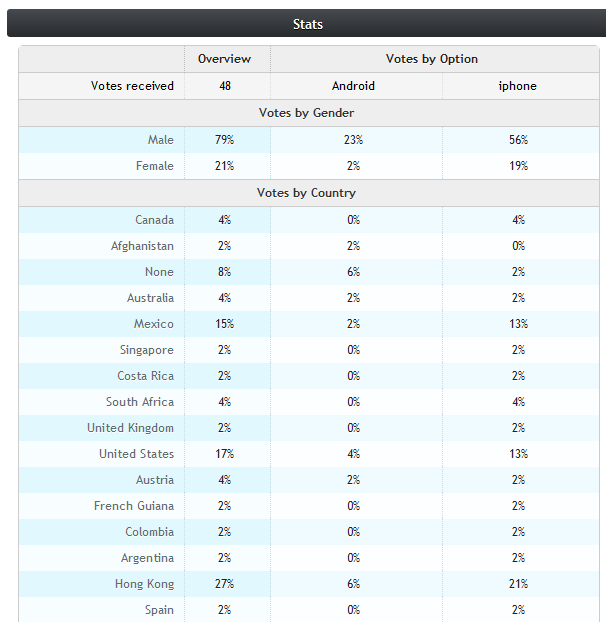 On the stats page, you will be able to view results by gender, country and age. This allows Flipter to be a viable research tool in understanding demographics. One of the special segments in Flipter is called “Talented or Not” where artists and musicians can post videos of themselves and be voted American Idol style for being either talented or not. Flipster is still in beta and I imagine more categories will be added in the future — probably movies, games, and food among others. 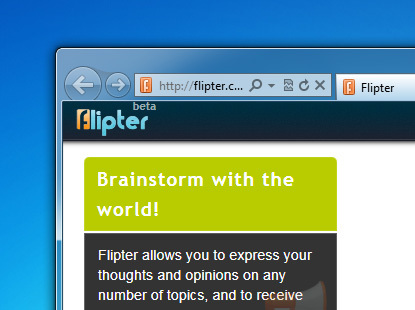 Flipter is a good venue to get opinions on different ideas quickly, with easy voting tools and robust analytics. It has a lot of potential but it needs to grow a steady base of users before it can be a viable service. We have not yet heard whether Flipter will become available for smartphones but in the meantime, you can follow them on Twitter.